City of Portsmouth duo Jacob O’Hara and Callum Crook celebrated double delight in today’s Junior Great South Run 12-15 boys race. O’Hara stormed to success in a time of 7min23sec, with Crook claiming third spot in 7.55 despite racing against competitors two years his elder. For the triumphant teen, it was an execution of a game plan honed in practice under the tuition of City coaches Pat Butcher and Vince Stamp. Crook, who entered the race with no expectations of a top-three finish, was indebted to a fast finish as he stole in for a prized podium spot. He said: ‘I am very pleased. ‘But I gradually got faster and had a quick finish at the end. Elsewhere, City of Portsmouth also enjoyed success in the 5k with Lachlan Wellington claiming second place in 15.57. 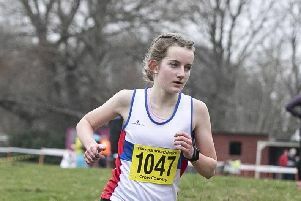 Eloise O’Neill claimed runners-up spot in the nine-11 girls category (9.22) with Aldershot Farnham & District’s Maisie Grice also earning silver in the 12-15 girls race.